installations I have ever seen would be an aesthetic crime." Spread the word. Talk to people about what is going on. Share this and other information on Facebook, Twitter, etc. 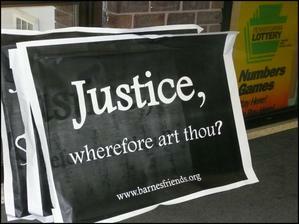 Urge journalists to write about the Barnes fiasco. Most people are uninformed. Make a financial contribution. It is tax-deductible and all donations go toward direct expenses like printing, website maintenance, and legal expenses. bringing new evidence before the Court about the improper role and conflict of interest of the Pennsylvania Attorney General. 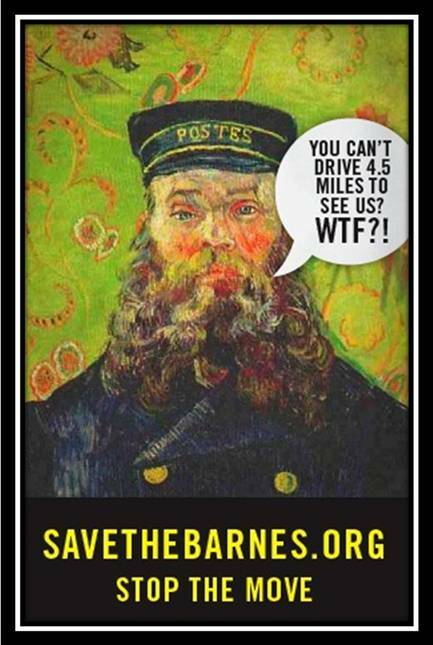 The PA Attorney General actively worked toward moving the Barnes art collection to Philadelphia and never presented evidence that the Barnes Foundation in Merion was a financially sustainable Pennsylvania cultural asset of immense historic importance. Oral Arguments were heard in August 2011. 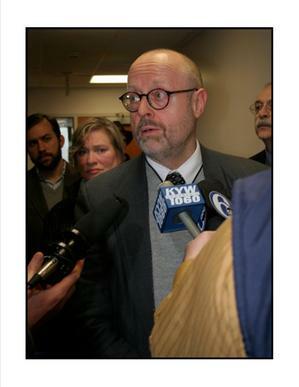 In October 2011, Judge Ott issued an Opinion denying the Friends legal standing, but NOT addressing the core issue of the improper role and conflict of interest on the part of the Pennsylvania Attorney General in the case. 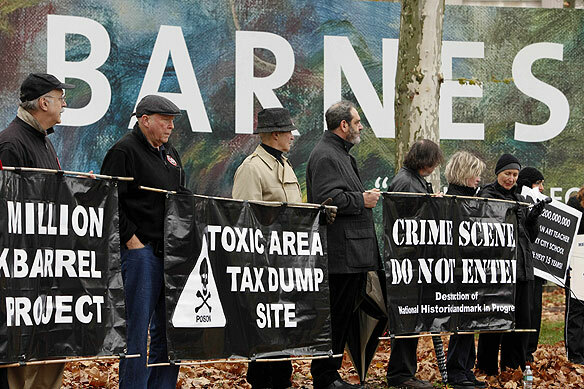 In addition, Judge Ott included Sanctions against the Friends to pay part of the Barnes Foundation's legal fees and expenses. This is like imposing a fine as if we had misused the legal system. 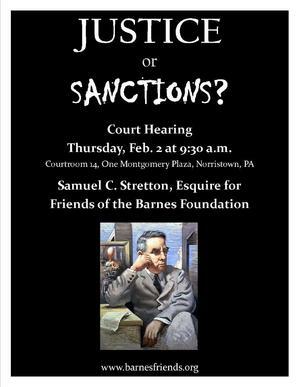 Mr. Stretton filed Objections to Sanctions and asked for a Hearing. on the Sanctions. Mr. Stretton argued that there is no basis for Sanctions against the Friends and they should be dropped. An Appeal to a higher Court can be filed only after Judge Ott issues a Final Opinion on the Friends' Petition, including a decision on the Sanctions. He did not say when he will rule. 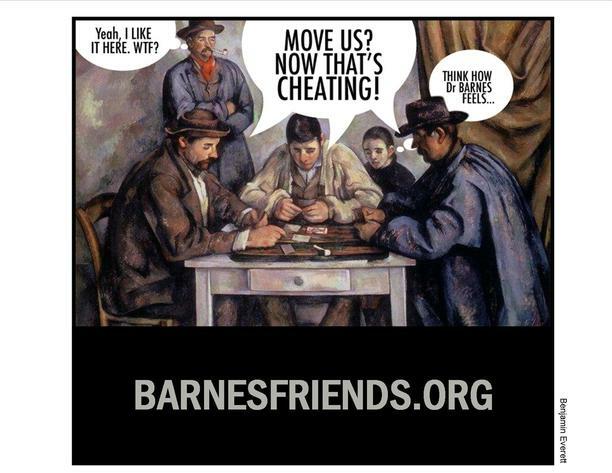 We want to thank Benjamin Everett, of Honolulu, Hawaii for the Talking Card Players and photographer Philip Lustig of Doylestown, Pennsylvania for the photograph of attorney Sam Stretton.